North Carolina man walked into a CU branch with a large stick and stole a wad of cash. Mugshot and image from security camera of alleged robbery. 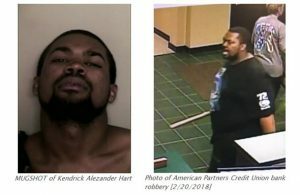 Credit union robberies are not unusual. Occasionally, however, the way in which credit unions are robbed is unusual, which occurred Tuesday in a small North Carolina city.